Choose a location for the shower. Decide whose home the party will be held in, or reserve a restaurant or party room. Prepare a guest list (consult with the mother-to-be), complete with full names, addresses, emails and phone numbers (if possible). Determine how many people can fit in the room or home. Decide if the event will be catered (and if so which company/restaurant) or if you or someone else will be helping make the food and determine who will be making what. 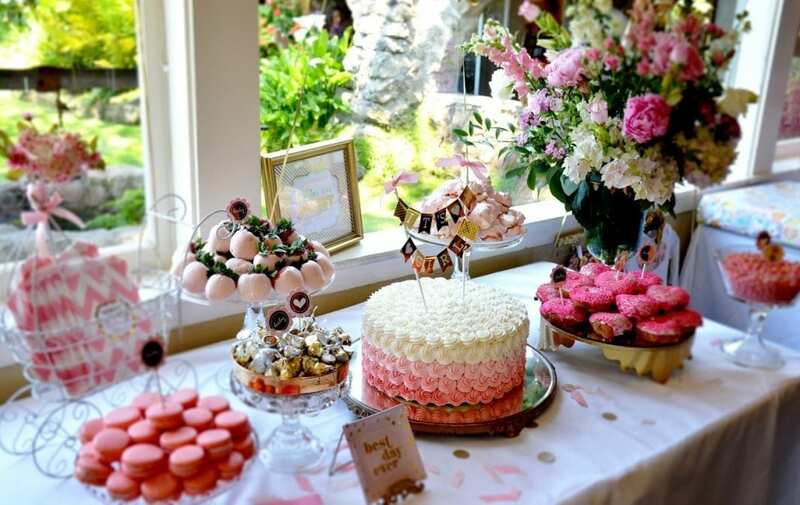 Ask the mother-to-be if she has a particular theme or color scheme in mind for the event. Order invitations and prepare invitations for mailing. If the expecting mama has registered somewhere for baby items, make sure her registry information is included on the invitation. If catering: keep the budget in mind. If cooking: assign who will be making what. Check if any of the guests have food allergies–make sure there are options available for them. Check tables, tableware, and chairs to make sure you have enough of each. If there isn’t enough, look up your local rental options. Decide what kind of decorations and/or flowers you’ll have. Make a list of any props or party favors you may need. Think about the games that you will want played as well as the prizes for the winners. Assign a photographer or hire a professional photographer. Order any entertainment (if you want a band, etc.) or additional surprises. Write out place cards, if desired. Order balloons and flowers if they are planned decorations. Are you going to have a flower crown, corsage or something special for the mother-to-be to wear for the shower? Order the props, prizes, or party favors that you’ll need. Wrap all favors and gifts. Have a plan for how the mother-to-be is getting to the shower. Is someone picking her up? Is she driving herself? Re-confirm your reservation if you are hosting the shower at a restaurant or party space. Clean or iron table linens if necessary. Re-confirm rental supplies (if needed). If catering: Re-confirm your order with the caterer. If cooking your own food: Prepare a shopping list for the food and beverages you’ll need. Re-confirm the entertainment or create playlist for a fun and inviting atmosphere. Phone anyone who has not called to RSVP and have a final headcount. Prepare dishes that you can freeze ahead of time for the event. Put together or re-confirm party favors. Shop for perishables, ice, and other remaining supplies. Have a comfortable chair picked out, with a pillow or seat cushion, for the mom-to-be to use at the shower. Pick up the cake and prepared foods, if you’re not cooking, or touch base with caterer. If hosted in your home: Vacuum, clean guest bathroom. Set up extra chairs for guests. Pick up balloons, if you’re using them as decor. If you pick them up earlier they could deflate. Have all hosts congregate at the party site an hour or two ahead of time to help set up. Introduce the guests to each other. Designate someone to help give gifts for the mother-to-be to open. Bending down is now more difficult for her. Designate someone to collect all wrapping paper for trash. Designate someone to repackage all the gifts for the expecting mom to take home. Collect all the gifts and place them in the mother-to-be’s car or ride. Give flower arrangements to the mother-to-be to take home or have the other hosts take additional arrangements. Clean up plates and cups once guests are finished. Gather all rented linens, tables, or chairs together if needed to be picked up or dropped off. There’s my checklist to help you have the perfect baby shower. Hope it’s a blast!